WASHINGTON, DC - Six influential members on the issue of science and space exploration have introduced a bill that would revamp the leadership structure within the space program in the United States. Reps. John Culberson (TX-07), Frank Wolf (VA-10), Bill Posey (FL-15), Pete Olson (TX-22), James Sensenbrenner (WI-05) and Lamar Smith (TX-21), have introduced the Space Leadership Preservation Act, legislation that will change business as usual at NASA and result in a more stable and accountable space program. The bill would create a 10-year term for the NASA Administrator to provide crucial stability of the leadership structure at NASA so that decisions are made based on science and are removed from the politics of changing administrations. The last 30 years have been marked by canceled programs due to cost-overruns, mismanagement or abrupt program changes at the start of each new administration. In the past 20 years alone, 27 programs have been cancelled resulting in over $20 billion wasted on uncompleted programs. This legislation establishes a new Board of Directors to provide a quadrennial review of space programs and a vision for space exploration that will set a tone for NASA's endeavors to ensure American preeminence in the space industry. "We have filed this bill today to make NASA less political and more professional by modeling their internal leadership after the FBI and the National Science Foundation," said Rep. Culberson, member of the Commerce-Justice-Science Subcommittee which funds NASA. "We also plan to make NASA funding more stable and predictable by enabling them to design and build new rockets and new spacecraft in the same way that the Navy designs and builds new submarines and ships. These reforms will save money and help their budget go farther in tough times, but more importantly, we hope to restore the NASA we knew when we were young and America landed the first man on the moon. Neil Armstrong's death has renewed our determination to preserve America's leadership in space exploration. We are confident these reforms will restore the NASA we have known, loved and admired and help guarantee that America continues to lead the world in space exploration in the 21st Century." "The U.S. enjoyed 40 years of unquestioned dominance in space, but the 21st Century has already seen increased competition from other countries, including those that don't share our democratic institutions or values - like China," said Rep. Wolf, Chairman of the Commerce-Justice-Science Subcommittee. "This status quo has to change, and the Space Leadership Preservation Act is our effort to start a national conversation on this very necessary reform effort. Our bill gets America back on the road to being a leading competitor in the next space race by outlining a leadership structure to develop a bold, strategic and long-term direction for the future of NASA and U.S. space exploration." "NASA has suffered from a lack of continuity and long-term vision," said Rep. Posey, Representative of Cape Canaveral, Florida. "Our bill fixes NASA's systemic problem and enables NASA to operate beyond short-term political agendas. It adds accountability to the agency, and puts an end to the abrupt terminations that have wasted too many limited dollars. The ability to commit to longer term projects will provide stability, which benefits our national space program, our national security, and will build the stable workforce that is needed to maintain U.S. Space leadership." "Yesterday, Houston bid a final goodbye to shuttle Endeavor on its way to its resting place in Los Angeles," said Rep. Olson, Representative of Johnson Space Center, Texas. "It was a sad reminder of where we have been as a nation in human space exploration and just how far we have to go. This legislation lays out a clear framework for what is needed to ensure American dominance in space exploration and a blueprint for how we get there. NASA needs a mission, the vision, the leadership and the resources to accomplish the mission. This bill provides it." Rep. Smith, Chairman of the House Judiciary Committee said, "America needs to be unified in our goals for space exploration. This legislation is a step in the right direction to provide stability in NASA's leadership and a constancy of purpose for NASA's programs." "We must give NASA much-needed accountability and stability to ensure America remains the world leader in space exploration," Rep. Sensenbrenner, Vice-Chairman and former Chairman of the House Science & Technology Committee said. 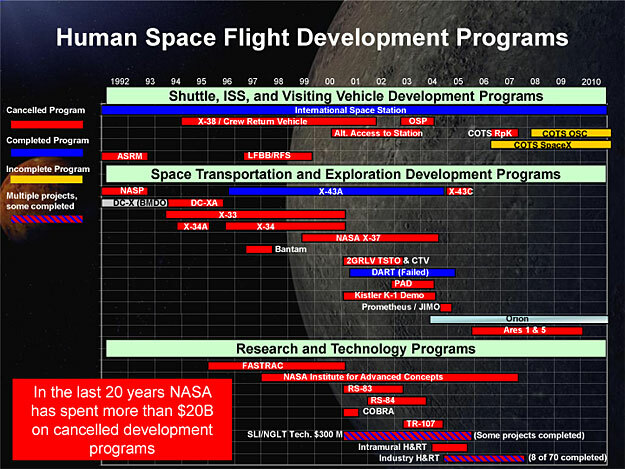 "With these reforms, NASA can make better use of taxpayer funds and pursue a more focused vision for our space program. Our space program is at a crucial juncture, and this legislation will help set NASA's budget according to national priorities and bipartisan expert input--not White House politics." Captain Gene Cernan, the last man to walk on the moon, also offered his support. "America's Space Program is just that - AMERICA'S Space Program," said Captain Cernan. "It has been a bi-partisan commitment in the Congress since the days of JFK's challenge to go to the moon. But, it has lacked long-term stability and focus because of the constantly changing political whims of the Executive Branch of government. This legislation is critical to providing the much needed continuity for the future of NASA's far-reaching goals in space." -- Preparing a budget submission approved by the Administrator and submitted CONCURRENTLY to House and Senate Appropriations and the president. -- Recommending three candidates for NASA Administrator, Deputy Administrator and CFO; the president is encouraged to select one of the above, who would then be approved by the Senate. -- Preparing a quadrennial review of space programs and other reports. -- It will also include a clause that states that no board member can work for a company which has business with NASA. * The Administrator would be selected for a 10-year term. -- This mirrors the FBI directors 10-year term. -- The board will be allowed to remove the NASA Administrator for cause. * The legislation extends the provision for long term contracting from EELV (Evolvable Expendable Launch Vehicle) to rocket propulsion systems and manned and unmanned space transportation vehicles and payloads, including expendable launch vehicles, and related services.